When I was first dating my husband we decided to go on a camping trip with several international friends. I wanted my husband to have the true ‘American’ camping experience, since he was french and hadn’t been in the states very long. And what’s more American than getting sick and sticky on s’mores. I couldn’t make it to the grocery store so I asked him to pick me up graham crackers, marshmallows and chocolate. He came back with saltines, impossibly tiny marshmallows that would never fit on a stick and Nutella (chocolate spread). Needless to say the s’mores were a french interpretation of the american dish. 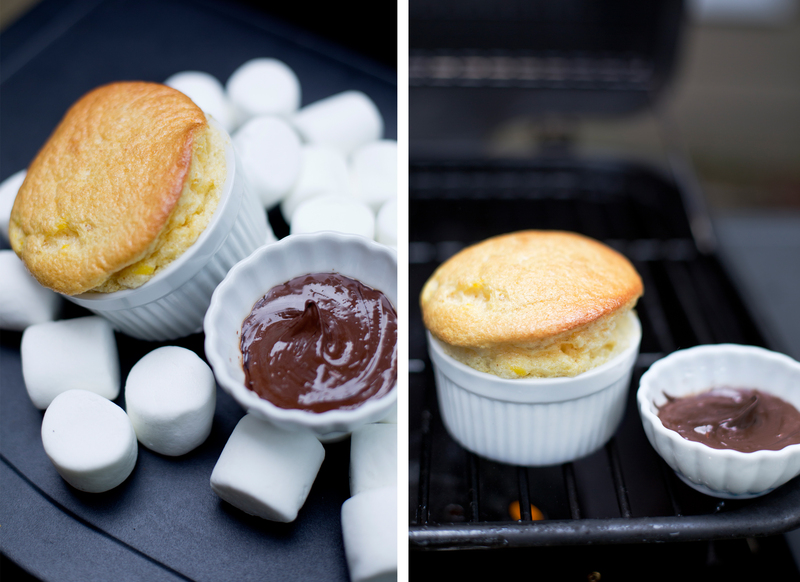 The S’more Soufflé is a perfect combination of American and French cuisine. It is a light and sweet dish, enhanced by pouring dark melted chocolate for the top of it. Yummy! It is also impossibly hard to photograph. 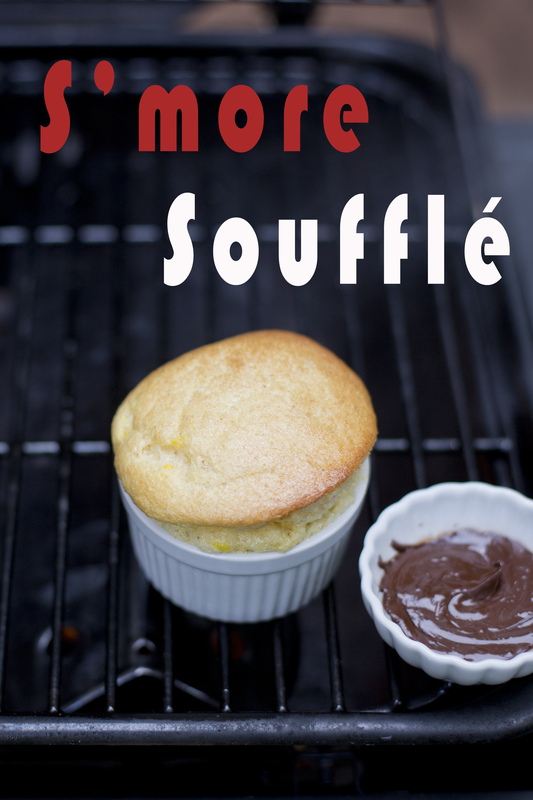 Soufflé is stunning… for about 30 seconds and then it collapses into a delicious dish of flatness. The recipe was created by New York City Chef Elijah Belanger. It is perfection. 1. Heat milk in saucepan, add marshmallows, heat lightly as marshmallows dissolve. 2. Wisk egg yolks in medium bowl, slowly add heated milk, then transfer back into sauce pan and lightly heat until mixture thickens enough to coat spoon. Remove from heat/Allow to cool. 3. In kitchen aid mixer, whip egg whites with a teaspoon of salt, until soft peaks start to form, add 2 tbs of sugar and whip until stiff peaks form. Do not over whip, or the whites will begin to fall apart. 4. Add crushed graham crackers to the milk/marshmallow/egg base. With a rubber spatula, Fold 1/3 of the whites into the then another third, then the rest. Note: Be careful not to over mix, as the air you have whipped into the whites, will then escape, and you’ll have non rising soufflés. 5. Butter soufflé dishes, coat insides with sugar, carefully fill with soufflé mixture, and then with any flat tool, butter knife, back of chef knife etc., scrape the top of the soufflé off creating an entirely flat soufflé. Then with a towel, clean the lip of the soufflé dish, so that there is no uneven residue that may bake on and then cause the top of the soufflé to bake on to the lip of the dish. 6. Bake soufflé’s in oven, should rise 1″, take about 15 minutes, depending on size of soufflé dish. 7. While baking, place Hershey bar in bowl over a pot of bowling water, allow to melt, wisk in butter, and pour into butter warmer, or dish for serving etc. 8. Serve soufflé immediately, before it collapses, stab middle with spoon, pour in chocolate. Enjoy. For another recipe from Elijah check out his Arnold Palmer. Categories: Recipe | Tags: alabama, dessert, elijah belanger, food blog, french dish, marshmellows, new york city chef, North Alabama, recipe, s'more, s'mores, soufflé, thejealouscrumpet, Violet Henri | Permalink. Thank-you, This was my first attempt at soufflés and I was pleasantly surprised at how it turned out. Very easy, you should try it. Good luck getting an oven. You don’t realize how much you use things until you don’t have them. Wow, thats a beautiful souffle! 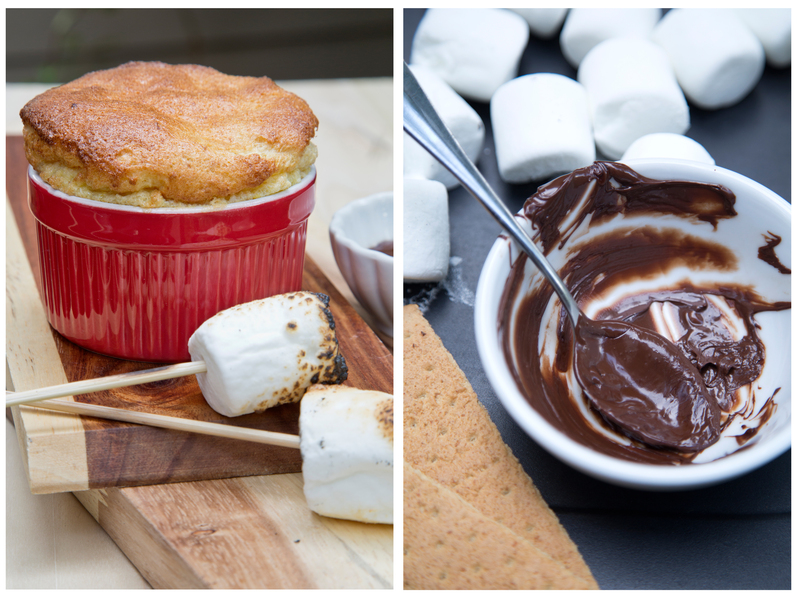 Nothing better than s’mores and incorporating into a souffle, heavenly! Thank-you! 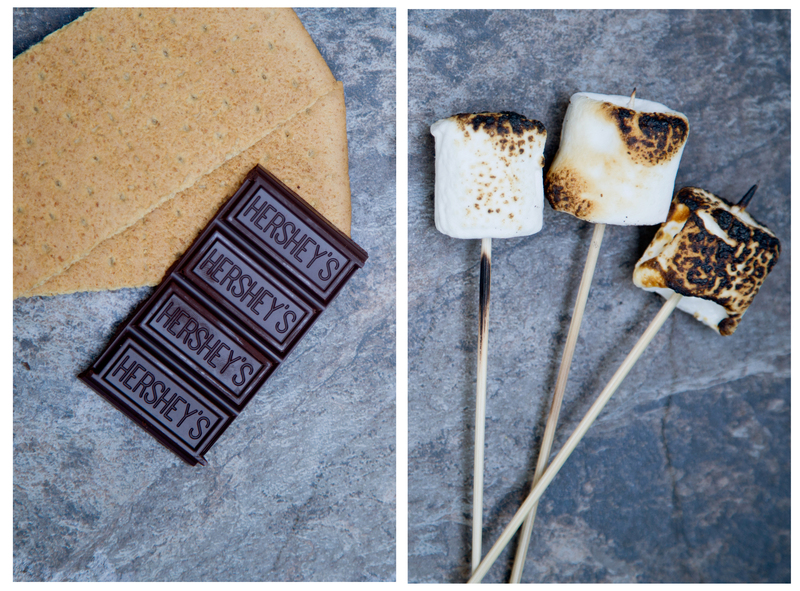 S’mores make everything better! Thank-you! No problem, but I’ll have to send one via post. 😉 I’ll trade you for the delicious looking chocolate treats in your avatar handle!